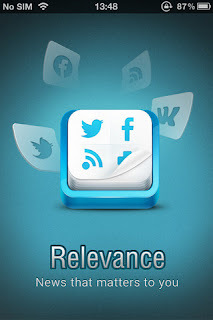 Developer Quote: "Relevance is a revolutionary new social media hub for Twitter and Facebook that personalizes your news feeds to deliver the most interesting, relevant and desired content messages that matter most to you." There is way too much information available through your social networks to get anything of value. This means you need some intelligent help sorting through it all and finding the relevant news. That's exactly what Relevance does. - Facebook and Twitter Aggregator: your feeds are displayed in one beautifully designed app. - Social Graph Analysis: No. of common Twitter accounts followed and No. of Facebook friends in common with the authors. - Your Reading Patterns: Messages skipped, time devoted to certain authors or posts, voting up or muting of certain sources. - Characteristics of Messages: Popularity of authors, number of likes, comments, replies and re-tweets, etc. 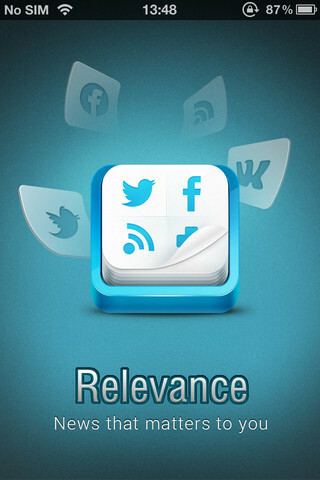 - Dynamic Learning: App learns your preferences with every refresh of the feed. 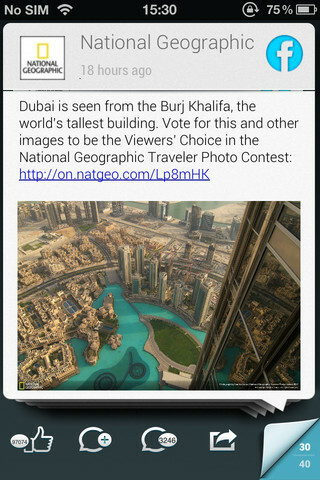 The app aggregates your Facebook and Twitter feeds, organizing them all into a beautifully presented whole. You set the time period of the messages you want to see, and easily get the latest news by looking at what's been posted in the last 15 minutes. The app learns what authors you tend to skip over, as well as the amount of time you spend reading other authors. Every time you refresh your feeds it learns your preferences. COOL CONCLUSION: More and more these days we need intelligent apps to help us sort through all the junk that's out there. Relevance is one of those intelligent ones! --iOS/Age Rating: Requires iOS 4.0 or later. Rated 4+. --Devices: iPhone 3GS, iPhone 4, iPhone 4S, iPod touch (3rd generation), iPod touch (4th generation) and iPad.